Power Grid Corporation of India Limited (NSE: PGRD) is a good bet for contrarian traders. Share prices tumbled from 225 – 199 in a span of last 3 months, which technically is an intermediate trend (Weeks to Months) as per Dow Theory. Fundamentally not much has changed with Power grid, the sell off is primarily because of Foreign institutional investors (FII’s hold 25% of shares in Power grid). As per recent data and reports, FII’s are liquidating their positions from Indian Markets feared over High valuation. Performance of Power grid share prices in October was quite different when compared to over all Market structure Price action (Mark down – Downtrend). Instead of making lower lows, prices fell sharply leading to selling climax and trend exhaustion. Bearish momentum declined, Prices capped at support zone 198 – 200, market made sharp highs. Selling climax and eventual increase in buying pressure from support zone indicates the trend termination, those solid green candles give us a good estimate of Bullish momentum. So what’s next? Will prices unfold in to uptrend or will Sellers cap the up moves and push prices into sideways Watch the Price action for clues and trade accordingly. The analysis was done using 5h time frame, so it’s suitable for swing traders and positional traders. Keep an eye on Power grid in coming days. 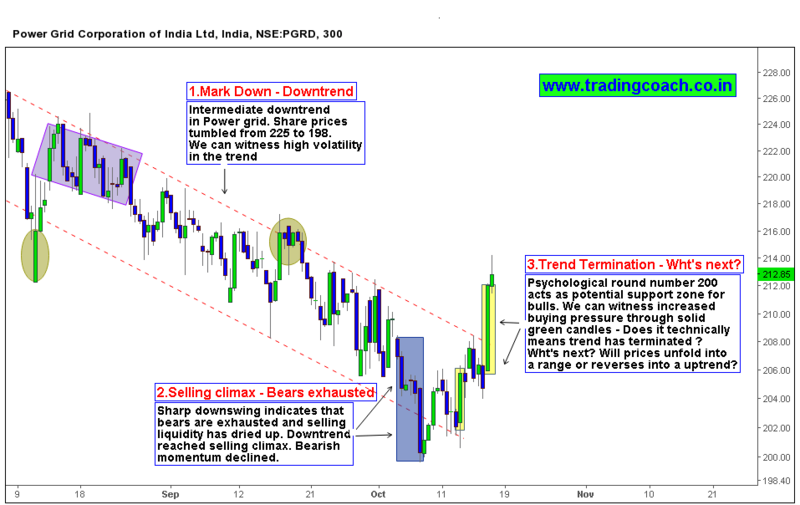 Lupin – Price action structure changes, Downtrend termination ?